What stories do you see in the media? Are they the stories you want to see? Do these stories reflect your life experiences? By day, I am a professional marketer, so I think about storytelling a lot. As a civically engaged and passionate resident of Magnolia Park (probably too passionate—I’ve been moved to tears talking about Magnolia Park more times than I can count…), I’ve been critically analyzing how my neighborhood’s stories are told, who is telling these stories, and what angles they’re telling the story from. Whose voice is being amplified? Whose experiences? Over the past year throughout the various community-building projects I have collaborated on, I have come to the realization that the voices of Magnolia Park—the abuelas sharing their stories while they craft tortillas, the abuelos who meet for coffee every morning at Dona Chela, the hard-working and industrious paleteros—exist in all of their colorful and insightful wonder, giving a beautiful and thoughtful dimension to our neighborhood landscape. But there just hasn’t been a space or platform to share their stories. What kinds of stories are told about Magnolia Park, then? In local media, they’re mostly crime related, or focus on some aspect of the area’s disenfranchisement. Occasionally a politician posts pictures of themselves at a meeting or event in the area. Crime is everywhere—the Heights has more crime than my corner of Magnolia Park—but if these negative stories exist by themselves, without being complemented by stories of the neighborhood’s beauty, innovation, and resilience, that’s a problem. I wanted to start to solve that problem. Underlying every community project I work on is the drive to amplify my neighbors voices, their experiences, their successes, and their concerns in a thoughtful, effective way. This year I volunteered my professional skills and talents to the free 5th Annual Magnolia Park Dia de los Muertos Block Party. This event is 100% volunteer-organized by a dedicated group of community leaders—many of whom are women of color and CEOs of nonprofit organizations. Collaborating with these wonderful people was truly eye opening, and they empowered me to the focus our marketing and promotional efforts on telling the story of Magnolia Park, the way its residents wanted. After months of hard work, we welcomed over 7,000 people to the block party. That is a notable portion of Magnolia Park’s total population, though with our promotional reach, a large portion of attendees were from communities across Houston. On our event registration page, we registered over 17,000 individuals. We also modified the party a bit—we added in new elements that reflected Magnolia Park’s unique culture, including an array of lowriders, a meet and greet by Chicano rights activist and artist Leo Tanguma who painted “The Rebirth of Our Nationality,” an area for Magnolia Park-specific artists, and an unprecedented exhibit highlighting the history of Magnolia Park and integrating the residents’ vintage photos of life in Magnolia Park. With those logistics and attendance figures alone, we succeeded. But I was not prepared for the response we received from attendees on the day of the event. It was completely overwhelming (in a good way) how much people connected with the exhibit—from the vintage photos, to the HCC documentary created about Magnolia Park, to the brief historical overview of the area. People were connecting with everything, getting misty eyed over images of their grandparents, of the buildings they played in front of as children, of the area that shaped who they are today. Of the neighborhood they grew up in and will always hold dear. They saw that other people were loving and embracing Magnolia Park for all its challenges and issues. But most importantly? Attendees saw us actively, jubilantly, relentlessly celebrating it and giving it the credence it deserves as Houston’s very first barrio, or Mexican neighborhood. As a collective, myself and the rest of the event committee were tangibly able to tell the neighborhood’s story, and that in turn inspired so many people to step up and offer their own stories! 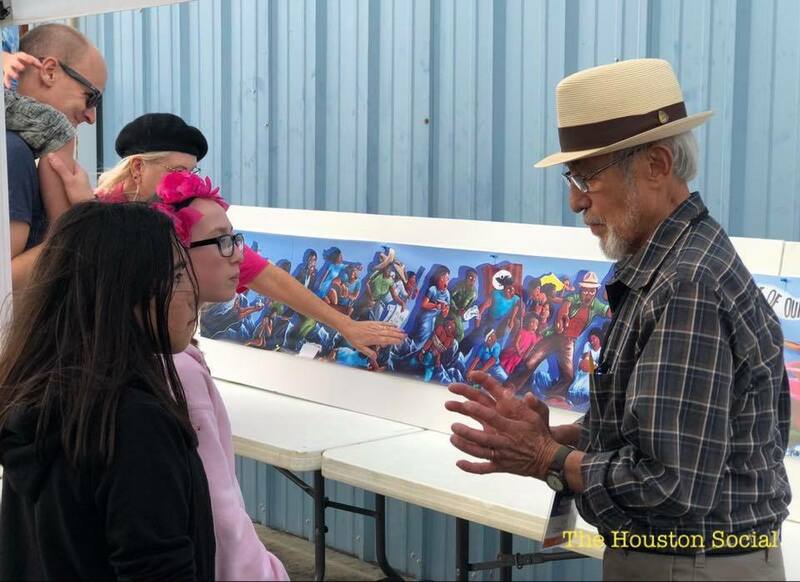 We received offers from people to donate their heirloom photos to us, to sit down and tell their stories to us to share, and most wonderfully, to donate money to a future museum for telling the story of Magnolia Park and all of Houston’s Latinx residents. We also partnered with Telemundo, who filmed during the event, and hours before we were scheduled to start setting up, we were contacted by the BBC—they ended up visiting to film a segment on Houston’s Latinx population. The event was featured in almost every major news outlet’s Dia de los Muertos event list, including that of my alma mater, Rice University. I spotted some Rice students there that day, and was glad I could help them learn about the corner of Houston that I happen to love most. I want to emphasize that the day wasn’t about avoiding or dismissing the “negative”—it was about proudly and sincerely holding up a mirror to the neighborhood, and letting my neighborhood see itself as it exists. Not romanticizing it, just being honest. And based on the many hugs, handshakes, and compliments we received, I think they found it to be quite beautiful. Living here and being part of the neighborhood continues to be a joy and honor. The next step in my work is to actually capture those specific voices and stories, and I’ve explored a few strategies to do so, but I will divulge those later. So last question: If storytelling is resistance, then what is a museum—an entire physical space devoted to storytelling?